It wasn't long ago that many of us were writing off Junior dos Santos as a heavyweight title contender. The former UFC Heavyweight Champion was brutally knocked out by Stipe Miocic in May 2017, and after a disagreement with USADA sat out over a year on the sidelines. Given his age at 34, as well as the amount of damage he took in the Miocic fight, his wars against Cain Velasquez, and his knockout loss to Alistair Overeem, it made sense that there were smart MMA minds believing JDS was on the downside of his career. But if he's shown us anything in his last two fights, it's that he's far from being done as a legitimate title contender in the UFC heavyweight division. Back in July, the UFC matched JDS up against UFC newcomer Blagoy Ivanov. In many ways, the UFC was using JDS in a gatekeeper role, which made sense considering the knockout losses and long layoff. However, JDS proved the UFC matchmakers wrong, tooling Ivanov for five rounds en route to winning a clear unanimous decision at UFC Boise. 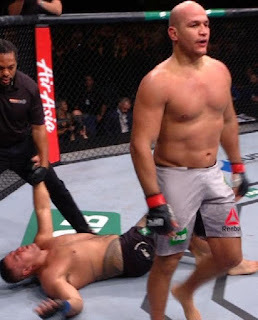 That was a good win over someone who was a top heavyweight outside the UFC, but it still felt like we weren't seeing vintage JDS, the heavyweight destroyer he once was. This past weekend at UFC Fight Night 142 we certainly did though, as the former heavyweight champion viciously finished rising prospect Tai Tuivasa in the second round via TKO. It was JDS' first knockout win since a 2013 spinning heel kick KO over Mark Hunt, and it announced the former champion's return as a top contender in the Octagon. Should JDS get the next title shot? Absolutely not. But he's not far away from the title, and a matchup against a top-five opponent makes sense for him next. After finishing Tuivasa, JDS took the mic and called out Overeem for a rematch. The pair previously met in 2015 with Overeem scoring a surprising KO win over the iron-chinned JDS. For whatever reason, JDS did not perform up to expectations in that fight, but the fact that he's calling out Overeem for a rematch shows that he wants that fight back, and we have to wonder if he wasn't 100% leading up to that bout. And with Overeem coming off of a TKO win over Sergey Pavlovich in his last fight at UFC Fight Night 141, the timing is right for a rematch between JDS and Overeem if the UFC does want to go that route. The fight I would book if I was the UFC, though, is JDS vs. Francis Ngannou. These two were previously supposed to meet at UFC 215 before JDS was pulled by USADA. With Ngannou coming off a brutal TKO win over Curtis Blaydes in China, it's the perfect time for these two to finally square off. Both fighters' most recently lost to Miocic, but they both have generally proven to be elite heavyweights inside the Octagon. JDS and Ngannou are arguably the two most prolific KO artists in the UFC, and with both men looking to get back into the title picture, a fight between these two makes a lot of sense. If I was Sean Shelby and Mick Maynard, that's the fight I would book. Aside from Overeem and Ngannou, JDS could potentially fight Lewis, Blaydes, Alexander Volkov or even Miocic in a trilogy fight. But I truly believe the Ngannou fight is the best one the UFC could make. For now, JDS can sit pretty as he waits for the UFC to call him with his next opponent. With back-to-back wins over Tuivasa and Ivanov, JDS is having a resurgence in his career, and it's great to see one of the nicest fighters in the game have this sort of success at this point in his career. We often forget about JDS when we talk about the best heavyweights in the world, but he clearly still is, and has been for the last decade. It looks like the rough patch in his career that he hit a few years ago is over and now he's ready to get back into the title mix. JDS is due for a big fight; now we all wait to let the UFC matchmakers do their job and select who they believe is the most sensible opponent for his next time out. 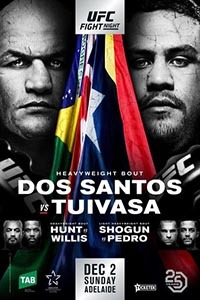 UFC Fight Night 142: Dos Santos vs. Tuivasa took place December 1, 2018 at Adelaide Entertainment Center in Adelaide, Australia.